Welcome back to the DH@UO blog as we kick off the spring term! A friendly reminder that today, April 5, is the Data/Media/Digital Graduate Student Symposium taking place from 9:30am-5:15pm in the new DREAM Lab, which is located on the first floor of Knight Library. To see the full list of graduate student presenters and the schedule, click here. The event is free and open to all. We hope that you will join us today! We would also like to draw your attention to a UO Libraries workshop series being held this spring. 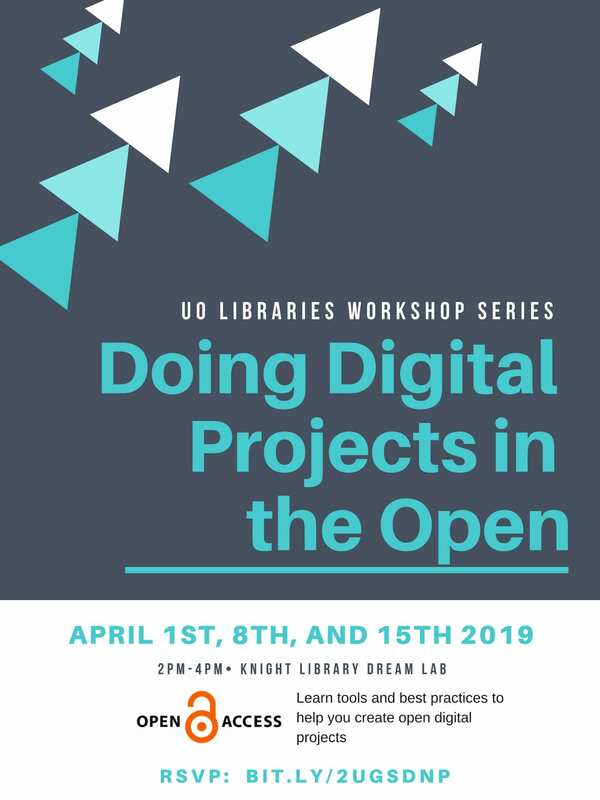 “Doing Digital Projects in the Open” will take place April 1, April 8, and April 15th. This is a three-part series designed to provide learners with a foundational understanding of open digital projects strategies and methods based on the Mozilla Foundation’s Open Leadership Framework. To RSVP to the workshops, please click here. Now, let’s jump into this week’s Friday Feature, which is packed full of DH opportunities. – connect with other digital humanities initiatives in the region and beyond. About: “ADHO SIG for Digital Humanities Pedagogy and Training Mini-conference and Meeting; 9 July 2019, 9am-1pm, at DH2019 in Utrecht, Netherlands Proposals due: 19 April 2019. The ADHO Special Interest Group for Digital Humanities Pedagogy and Training invites submissions for a special mini-conference to be held Tuesday, 9 July, 9am-1pm before DH2019 in Utrecht, the Netherlands. Building upon the DH2019 conference theme, “Complexities,” we are eager to foster a discussion about the many ways in which DH is taught and learned in academic contexts across languages, borders, cultures, and academic structures. This half-day conference will consist of presentation and breakout sessions. The presentation format will focus on lightning talks of 5-10 minutes. Proposals may be submitted via this link, before Friday 19 April 2019; proposals should include the name, affiliation, and email address of the proposed presenter(s), as well as a lightning talk title and an abstract of one to two paragraphs (250 words maximum). Next Post A Successful Data/Media/Digital Graduate Symposium!